Within historic districts and established neighborhoods, architectural and site design compatibility is very important. This importance is expressed int he City of Ashland's "Site Design and Use Standards." Specifically, the Historic District Standards recommend the following elements be consistent with neighborhood appearance - height, scale, massing, setback, roof shapes, rhythm of openings, platforms, directional expression, and sense of entry. Every attempt was made to provide a site and architectural design that is consistent with these elements. Complimentary building massing is an important design element in insuring historic neighborhood compatibility. This design shows the duplex broken up into smaller, varied masses. These include separate porch entries, first and second story building heights, a varied gabled roof and articulation of the building walls (in and out), and a variety of building setbacks. Further, the massing of the duplex steps up from the street and then down in the rear to keep from looking "box-like." The architect and owners also preserved the existing historic home. This home was moved on the site to be compatible with the existing similar home on the adjacent property. Overall, the three residential units work well together while blending with the established neighborhood. This new residence was the first building in the historic districts to request a variance to exceed the Maximum Permitted Floor Area. This new ordinance was intended to limit the size of new buildings or additions to be compatible in scale with the typically smaller historic structures found in historic neighborhoods. The building site was very difficult with steep slopes, narrow building envelope and minimal access, but, being a test case for the new ordinance, added to the challenges with much neighborhood opposition and Historic Commission scrutiny. Michael Ryan and Carlos Delgado responded to the concerns with a beautifully compatible historic structure. The mass of the building is well disguised with floor levels stepping down the hill with cascading hip roofs and lots of corners and jogs in the exterior wall lines. 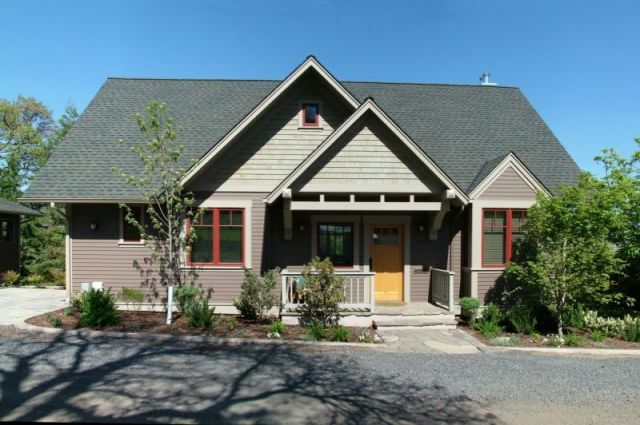 The façade is richly detailed with a mix of wood shingles and horizontal lap siding, wide trim boards, generous eaves and cottage styled garage doors facing Scenic Street. The Historic Commission is proud to honor Michael Ryan and Carlos Delgado for their perseverance, fine design, workmanship and for demonstrating that the Maximum House Size ordinance is working well in the Historic Districts. Michael Ryan and Carlos Delgado responded to the concerns with a beautifully compatible historic structure. The mass of the building is well disguised with floor levels stepping down the hill with cascading hip roofs and lots of corners and jogs in the exterior wall lines. The façade is richly detailed with a mix of wood shingles and horizontal lap siding, wide trim boards, generous eaves and cottage styled garage doors facing Scenic Street. The Historic Commission is proud to honor Michael Ryan and Carlos Delgado for their perseverance, fine design, workmanship and for demonstrating that the Maximum House Size ordinance is working well in the Historic Districts. Not often is a home as well designed to fit into a Historic neighborhood as Jason and Anne Robison’s new home at 55 Scenic Drive in the heart of the Skidmore Academy Historic District. When the Robison’s bought the property there was a existing non-historic and long neglected home on the lot which had long been an eyesore in the neighborhood. They consulted with their designer, Eric Laursen, about the possibility of adding to and remodeling the existing structure, but it was so poorly designed and constructed that this just wasn’t possible. Rather than that, the designer and owners worked closely to create a home of distinction ideally suited to the irregular lot and historic neighborhood. Nestled into trees and other mature landscaping on the property the home appears to belong in it’s setting far more than the original structure ever did. 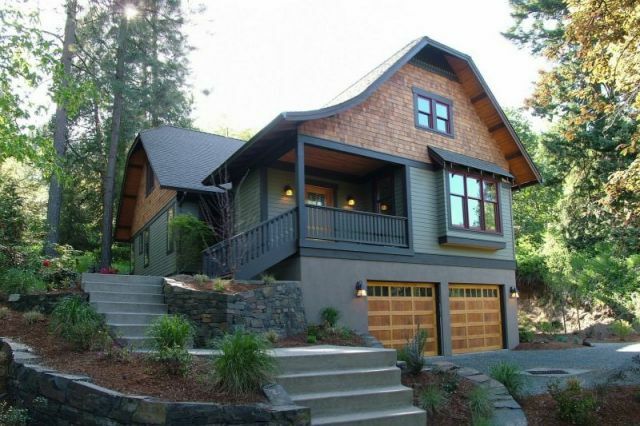 The beautifully constructed home incorporates many natural materials, such as, stone, shingles and wood windows that seem to marry the home to its site. The inside is as finally detailed and beautifully finished as the exterior, but has a more contemporary feel that seems perfect for the lucky young family who occupy it. 55 Scenic Drive is a wonderful example of true craftsmanship seldom seen today and a home that the owners and designer have every reason to be proud of. 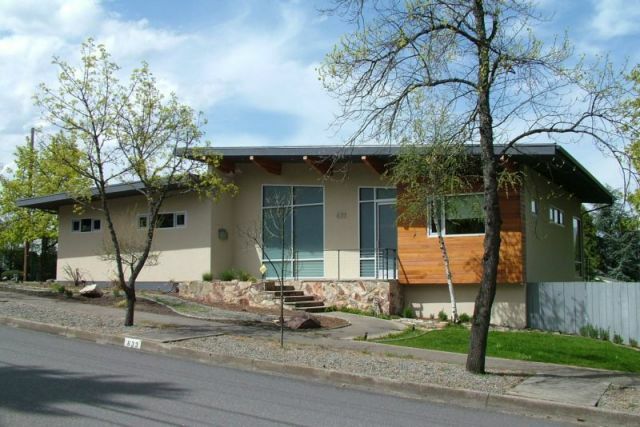 The City of Ashland Historic Commission Award for Historically Compatible New Residential was unanimously voted to Karen & Wesley Chapman for the home they built for themselves at 112 Almond Street. As development of new homes continues rapidly in our area it is becoming increasingly difficult to find buildable vacant lots. In 1975 Wesley and Karen Chapman purchased 2 tiny carriage house lots across from their home, to be used as a garden and 4H chicken coop for their children. During the past two years they decided to build a new, more efficient home for themselves on this same lot that, today, would now be considered non-conforming due to its small size. Architects Ray Kistler & Matt Small designed an elegant and beautifully proportioned home for the Chapmans in a modern bungalow style. The Historic Commission was impressed with their design that uses a difficult, sloped lot to advantage to create a beautifully detailed design with appropriate size and scale to its historic neighborhood. The Chapman’ home was built with a high level of craftsmanship and attention to detail by General Contractor Sean Downey of the Downey Company. The quality of design, construction demonstrated, and the choice of materials used on this project set the standard of new construction to which all building in our community should aspire. The Chapman residence, at 112 Almond Street is a home that will prove a valuable asset to this historic neighborhood for decades to come. The Historic Commission’s award for Historically Compatible New Accessory Building or Detached Garage goes to those involved in the creation of this new compatible two-car garage at 360 Pearl Street. The owners and contractor collaborated in creating a modest and functional addition to the property. 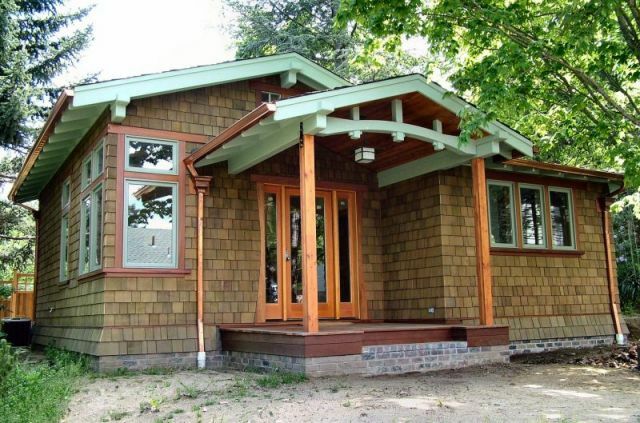 This single-story, wood framed building incorporates many of the craftsman details of the existing home and studio, including, but not limited to cedar lap siding, architectural grade roofing shingles, carriage-style garage doors, exterior craftsman sconces, and copper gutters and downspouts. Overall, the new structure fits comfortably into the landscape and compliments the existing house and studio. This historic contributing single family residence was built in 1914 by J. N. Dennis and was later owned by George A. Briscoe, a well-known educator in Ashland for whom Briscoe Elementary school was named. 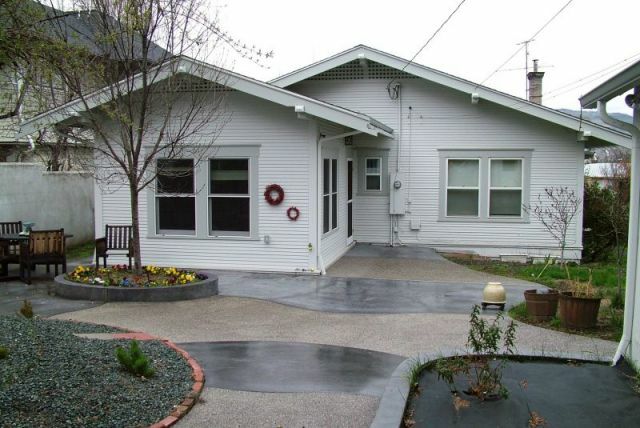 The craftsman bungalow style house is distinguished by its offset front porch and battered pillars and charming proportions. Carmon Auble and his wife worked with the Historic Commission to develop a design for interior improvements and a room addition in the rear of the residence that closely followed the characteristic materials and form of the original residence. The addition was inset from the side of the existing residence to allow for roof overhangs equal in dimension to those of the original building without encroaching into the required side yard setback. The existing detached garage with corrugated metal siding was saved from demolition and refurbished to become a useful structure in scale with the site and the neighborhood as visible from the alley. Carmon gives credit to Jesse Blue who provided high quality carpentry that blends in seamlessly with the original structure. The consideration and care in keeping within the historic context of the original structure has resulted in improvements that are useful and pleasant to look at and the Aubles are glad to have worked with the Historic Commission to maintain the character of the original dwelling and garage in this historic neighborhood. 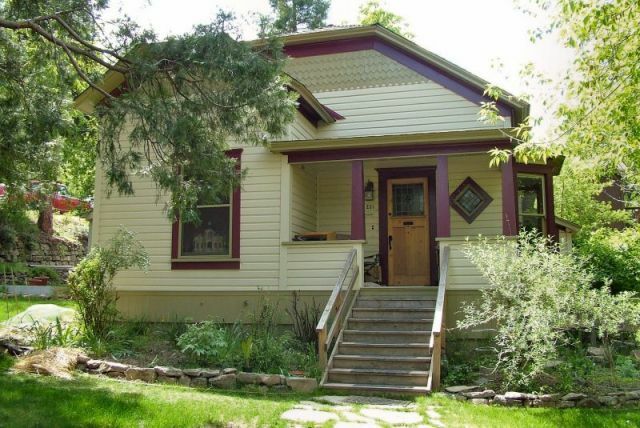 The Historic Contributing Pennebaker-Barney House in the Siskiyou-Hargadine Historic District was originally built in 1892 by Benjamin Reeser. In 1898 lumber manufacturer, George Pennebaker bought the property and added to it. Again, in 1910 the property changed hands and was completely remodeled by the new owner H. A. Barney. Sometime in the 1960’s a poorly constructed addition without a foundation was added onto the back of the home along with various other “patched up” modifications to the original structure. For over twenty years the home was known as “the kid house” and was used by a non-profit organization as a day care center. During this time the home had very little maintenance, continued to deteriorate, and lost much of its historic character. When Keith Swink and Jana Carole bought the property, it was in very poor repair and in need of just about everything! Keith called on his contracting background and skills to give the home a new life and restore much of its historic appearance. The entire back portion of the home was jacked up and a new foundation built, new siding was custom milled to match the original and replace the five different types of siding on the house and the original windows were removed, repaired, and re-installed. New wiring, plumbing, and heating/air-conditioning systems were installed. Finally, the home was given a fresh coat of paint in historically appropriate colors and the grounds were re-landscaped. No longer the ugly duckling in the neighborhood the home is now ready for it’s second century of useful life. This house was built and finished in 1963 by R.W. (Bob) and Mary Voris after six years of design by the couple. 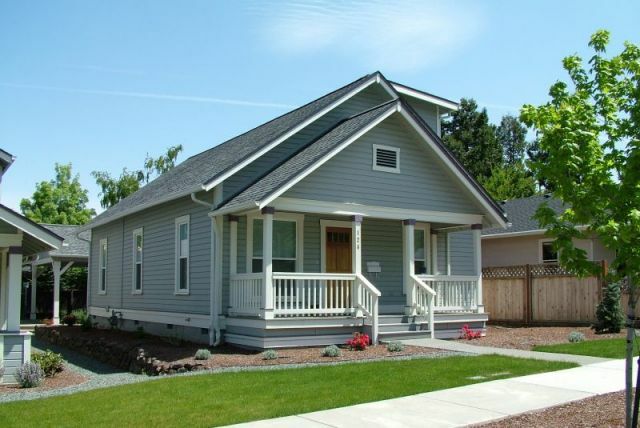 In 1954, the State of Oregon began issuing licenses for real estate and building contractors. Bob was the first in line and received both licenses. Bob died in 1982 and Mary lived in the house until her death in 2004. According to their son, Randy Voris, the roof o the house was the only one in town to survive the Columbus Day hailstorm of 1964. The new owners, Adam and Mindy Fox, came from New York to Ashland five years ago. Their first home and restoration project was 291 Terrace Street. 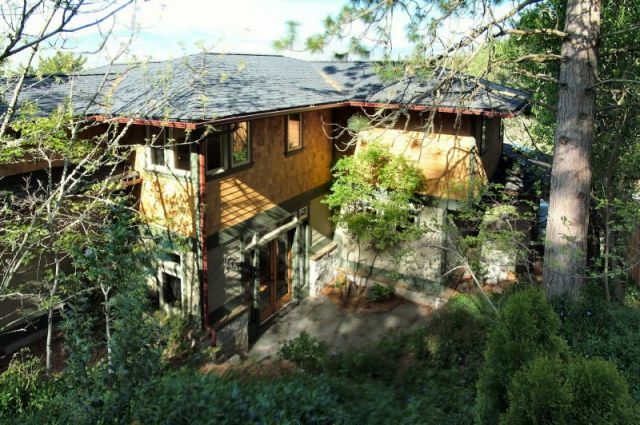 It was built in 1976 and they remodeled it from a basic “Brady Bunch” style house into a Pacific Northwest Zen exterior. Adam had his eye on 633 Iowa and when it came up for sale, he was on to his next quality restoration of a mid-century period design. With help of Jessie Blue, the exterior façade and open beam ceiling were tastefully transformed. The replaced the aging plywood siding with stucco and horizontal wood accents and replaced all the windows with commercial aluminum sash. The exposed glue laminated beams highlight the low-pitched open beam ceilings. Additionally, the interior was completely updated and designed by Adam Fox with exquisite contemporary detailing. We think Bob and Mary Voris would very much appreciate how Adam and Mary Fox have thoughtfully restored and updated the house while preserving their sixties style design efforts. 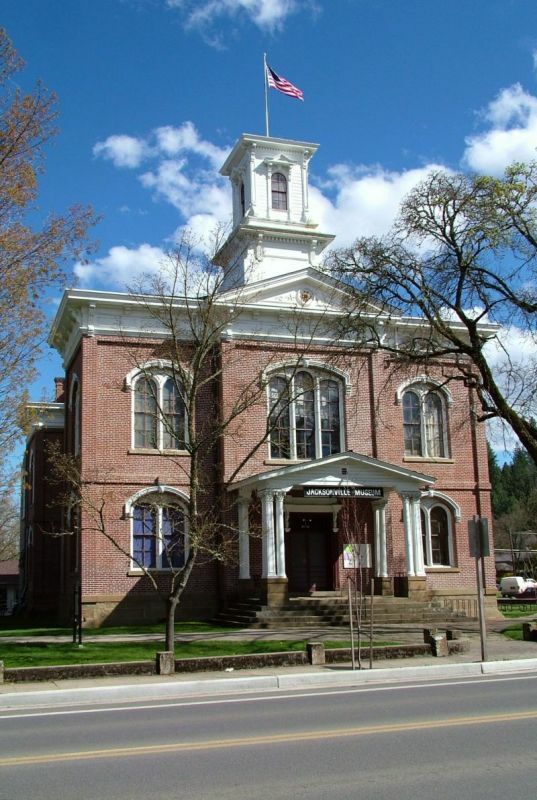 In 1946, the Southern Oregon Historical Society was formally organized to save the 1883 Jackson County Courthouse in Jacksonville. 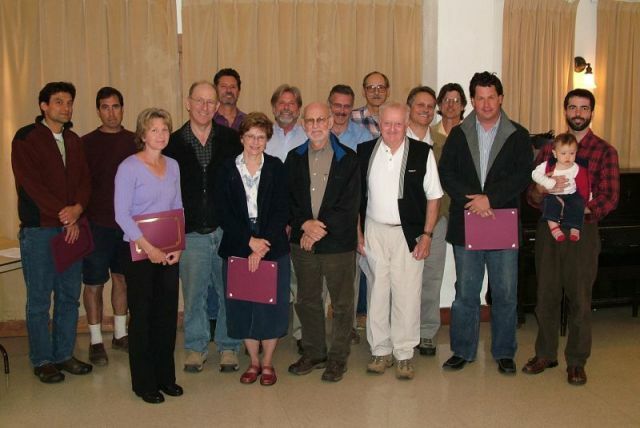 The original board of directors included prominent pioneer men and women from throughout Jackson County who shared the vision of preserving southern Oregon's history. In 1950, the Courthouse opened as a museum displaying items from the community that illustrates our region's history. The Historical Society has grown over the 60 years. Besides six historic properties in Jacksonville and the nearby Hanley Farm, the Historical Society can rightfully boast about its extensive two- and three- dimensional collection. A bulging two-story warehouse in White City and the remarkable research library in Medford are filled with Jackson County's historic treasures. For us here in Ashland, the Southern Oregon Historical Society provides programs in the schools and parks, walking tours, the co-production of Jefferson Public Radio's “As It Was,” and technical assistance in the care and preservation of architecture and personal artifacts. They have also helped out with research material for everything from haunted cemeteries stories, maps to the locations of old mills to drawing of a Frank Clark house, and in the recent past, museums, bus tours and grants to restore our monuments. And that's keeping the list short! Collecting, preserving, and sharing history is a big job. We thank you for your 60 years of service and we hope that your future continues to be filled with our past.